ELXSI Corp. has been on my radar screen for years. The company’s primary subsidiary is a fast-growing, very profitable business in an industry with a great demand outlook. The company’s less-profitable subsidiary is winding down and becomes less and less relevant as time goes by. Gross margins, operating margins and returns on capital are all reaching new heights, and the company has built a solid cash buffer. With all those positive dynamics in place, just what is it that has kept me out of ELXSI? The answer is one word, the same word that keeps me out of many otherwise attractive small companies: management. ELXSI’s history is riddled with exploitative related-party transactions that have resulted in a massive value transfer from ELXSI’s minority shareholders to company insiders. More on that in a bit. For now, let’s examine ELXSI’s corporate history. A decade ago, ELXSI was a struggling restaurant operator with minor manufacturing operations in Florida and a retail store installation business in Illinois. The company had purchased 30 Bickford’s and Howard Johnson’s restaurants from Marriott Family Restaurants, Inc. in 1991, but changing trends in the restaurant industry and ballooning costs caused the company’s operating income to erode, turning negative in 2004. Realizing that most of its restaurants were beyond rehabilitation, the company spent the next several years shutting down or selling off properties. In 2007, the company shut down its retail installation business after losing a significant client. Today, ELSXI operates only six restaurants in Massachusetts and New Hampshire, and leases three restaurants to third parties. Restaurant revenues accounted for 62.9% of total turnover in 2004, but only 11.1% in 2013. While the restaurant segment is a shadow of its former size and importance, the company’s manufacturing operation has become a force. Cues Inc. is the name of the business, and its success has completely changed the picture for ELXSI. Cues manufactures robots and systems for use in inspecting pipelines, especially sewer lines, water lines and industrial process lines. Cues has grown its top line at 5.9% annually for the past decade, and now accounts for the great majority of ELXSI’s revenues, earnings and assets. The outlook for Cues’ products is bright. American water and sewer infrastructure has suffered under-investment for generations and is approaching a critical state. Water mains one hundred years or older are still in use in many areas, and some cities still rely on pipes made of obsolete materials, even wood . (In all fairness, it seems that wooden pipes actually have quite a long useful life, though they require quite a lot of expertise to repair.) In my view, products that enable inspectors, engineers and others to evaluate existing infrastructure will be more necessary than ever in coming decades. Of all the various types of infrastructure, water delivery and treatment systems are among the most critical and most need of investment, and Cues will benefit from that trend. Cues’ success and the winding down of the unprofitable restaurant segment has allowed ELXSI to more than double its EBIT since 2007, even as sales fell 10.7%. Never underestimate the power of expanding margins! Indeed, ELXSI posted an EBIT margin of 7.7% in 2013, a great improvement over the 1.2% EBIT margin “achieved” in 2007. Here’s a look at ELXSI’s results for the last decade. As ELXSI’s profits have risen, so has its efficiency. The company now generates a respectable NOPAT/Average Invested Capital ratio of over 15%, compared to a the single digit or negative figures of years past. The company’s balance sheet is strong, with net cash of $2.4 million. Despite the greatly improved profitability and healthy outlook, the market affords ELXSI only a modest valuation. Loan number 2: ELXSI loaned another $909,000 to ELX, to be used to purchase 110,200 shares of ELXSI Corp, again from Mr. Kellogg. Loan number 3: ELXSI loaned $2 million to Cadmus Corporation, an Alexander M. Milley-controlled corporation. Loan number 4: ELXSI loaned another $6.73 million to Cadmus corporation. In total, ELXSI loaned $10.8 million dollars to entities controlled by its chairman, in part so the chairman could purchase company stock. That is a LOT of capital used to enrich the chairman at the expense of shareholders. And guess what? ELX and Cadmus never even paid the minimal interest expenses accrued on the debt. In 2013, ELXSI forgave the entire balance, both principal and accrued interest, in return for 486,990 of its own shares worth $4.55 million. For those keeping score, that’s a net loss to shareholders of $6.25 million, not including millions in accrued interest and opportunity costs. In return for the loan forgiveness, Cadmus Corporation also agreed to terminate its management contract with ELXSI. Oh, did I forget to mention the management contract? Since 1989, Cadmus and ELXSI had an agreement specifying an escalating management fee, payable in years where ELXSI’s operating income exceeded $4 million. ELXSI had not paid the management fee for the last few years, letting it accrue. In 2013, ELXSI paid Cadmus $3.12 million to settle the accrued fee and terminate the contract. You read that correctly. 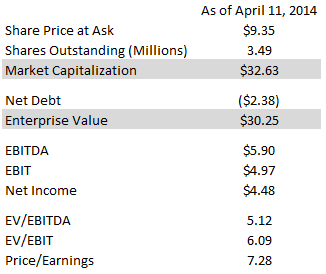 Despite shorting ELXSI $6.25 million in principal value on the debt settlement, Cadmus and ELX somehow still received $3.12 million in cash to settle the accrued management fee. As a final insult, on January 1, the company agreed to issue Alexander M. Milley 80,000 shares of stock in each of the next five years, providing the company earns at least $4 million for the year. As a result, Mr. Milley is likely to receive back nearly all of the shares his companies conveyed to ELXSI for debt settlement. Perhaps the days of the worst shareholder abuses are past, but the potential remains for additional value transfers to management at the expense of minority shareholders. For that reason, I’m staying away from ELXSI. It’s a shame, really. I’ve love to own some shares. But when I invest in a company, I need to be confident that my proportional share of earnings and cash flow will accrue to me. With ELXSI, I simply can’t be sure. Alluvial Capital Managment, LLC does not hold shares of ELXSI Corp. for client accounts. Our paths cross yet again….I owned ELXS briefly back around 2006. My father owned stock in them since the 90’s. Much like Calloway’s their real estate was worth what the company was trading for, but this was many years ago. I sold too soon, and booked a small profit. I was put off by all the related party transactions too. Mr. Milley & family got many advantageous deals. If I remember correctly, Mr. Milley is a Harvard graduate. Perhaps his company could be a case study for his alma-mater? A real shame, as Cues will probably have a TREMENDOUS amount of work coming up. Much of the USA’s water infrastructure is overdue for repairs & replacement. In my hometown of Detroit, there are MANY functional water pipes that are 100+ years old. I am sure Detroit is not the only American city like this. We probably have more stocks we own or follow in common than those we don’t. 🙂 The past few years really have been good ones for shareholders, but how much better they would have been without the shady insider transactions! Didn’t the company only get back 368,239 shares from Milley and his entities, making the transaction even more lopsided? You are correct! I double-counted. The transaction was even worse that I wrote about. I think my mistake was the result of checking the returned shares against the decreased share count, but on further review the statement of changes in equity reveals that 368,239 shares were returned in the debt transaction and another 113,401 were simply repurchased. Did you take a look at the most recent earnings report? I did. Looks good. Cues is a standout division as usual. If management can behave itself for a little while longer, perhaps this one deserves a closer look. Have you followed the company as of late? Operations look really good. The Cues division continues to benefit from increased need for inspections and repair work on municipal water infrastructure. I still don’t trust management so I’m staying away. But I have to admit the ratios look great! Kelso Tech’s looking good with the plans for an uplisting! This is the only intelligent analysis of ELXS in existence that I can find. Thank you for doing the work to clarify things. What we have here is a “roach coach”. A company who’s CEO, Sandy Milley, is not happy with reasonable typical pay for a company of this size and profitability. Milley had to have more. The entangling “related party” transactions have been extremely frustrating, look terrible, have cost ELXS at least $12 million in losses and even more in lost opportunities over the 14 years they have been on the balance sheet. Rightly so the market has penalized ELXS with a very low stock price. This bad movie began in 1999 I believe, near the top of the dot com craze. Sandy Milley had ELXS buy millions of dollars worth of JDS Uniphase. Shareholders cried foul and Milley quickly sold the stock. I think Milley then borrowed $12m from ELXS and bought the JDS Uniphase stock himself. He lost big, thus setting up the longstanding related party loan that infected the balance sheet for 14 years. Like a Gordian Knot, ELXS never made enough money to pay Milley/Cadmus enough to pay off the loan, and the ELXS stock price, contaminated with the toxic loan, never got high enough for Milley to pay back the loan. Shame on the Independent Committee of the Board of Directors for its stunningly dreadful deal of trading 368,239 shares to cancel $16m of debt and accrued interest. When I saw this I was utterly speechless. The company has a lot going for it. It was originally a busted minicomputer company with lots of IPO cash left over, a huge NOL carryforward, and no operating business. A blind pool. Enter Sandy Milley. It bought Bickfords and Cues. Back in the day it had 65 restaurants and over $100m annual revenues. Now with mostly Cues, and the latest quarter EPS of $0.69, performance has been spectacular. There is a $43m NOL carryforward plus $4.9m of tax credits such that it will be almost tax free for a long time. Cash is piling up and it is buying back stock. I think if it were not for Sandy Milley’s shenanigans and his parasitic drag on shareholder returns ELXS would be a $30 stock. Sandy Milley and shareholders would both be much better off. Thanks again for studying the statements and stating the case for ELXS. Thanks for the kind words and for providing some additional company history. Like you point out, it’s a true shame what has gone on here. The Cues division is a gem of a business and should only do better going forward. Still, I simply can’t get past the awful corporate governance and the chance that shareholder dollars will be de facto stolen once again. Whoha! SPX buyout of ELXS at $51 per share. The deal closed last week. According to the tender document, Sandy Milley held out for an offer in the 50’s.